--Preparing the meal takes time, and unless you are a 19th century abuela -- like my late, great grandmother Isabel, my muse for everything Puerto Rican that I try to do in the kitchen -- you are going to make mistakes. You will burn food, you will burn yourself, you will make major cooking errors (I did all three). Before you start, you may want to pour yourself a drink (así, bobo -- pour me one, too). --Unless you live in a Carribean or Asian community, you may have trouble finding all the right ingredients. But the required list is simple, and I've kept it even simpler, cheating only once (by substituting bacon for fatback, which the folks at Whole Foods are pretending they never heard of -- sinverguenzas). --Prepared correctly, this dish has LOTS of garlic. So much, it freaked out my wife when she saw the assembly for the final stages. Advice: keep all adults out of the kitchen. There are other things in this dish that might freak out the feint of heart. Recommended: click on the photos to see the truth up close. You'll need three of these -- unripe. Yes, they look like bananas, but they're different. No substitutions here. Slice the plantains into one-inch pieces. Cut diagonally so that they look like this. Extra surface area means easier frying. Soak the plantains in a large bowl of water and salt. Dry them afterwards. Fry 'em up. 350 degrees F, for fifteen minutes. Here's where you are likely to burn yourself. Time for a beer, if you haven't had one already. If you can't find a Puerto Rican brew, try Mexican (¡ese!). While the plantains are frying, and you are drinking your beer, you may want to start crushing the garlic. Use a wooden mortar and pestle, and crush six large cloves (ignore all other recipes which ask for three; ask your spouse to leave the room). Time to check in on the plantains. This is what they look like after 15 minutes. Time for a second beer. You're feeling good at this point, despite the second-degree burn. ¡Mambo! Oh yeah -- we almost forgot the fatback. We couldn't find any, so we got a nice big bag of bacon. But another problem -- all the burners are going, splattering oil here and there. Let's cook the bacon like modern, contempo-Suburbo Ricans. Arrange five slices in a bowl with paper towels, cover with more paper towels, and microwave on high for five minutes. It'll come out perfectly. Remember when I said that plantains are different? Well, for one thing, plantains are super dry. Some recipes call for a clear broth to moisten the dish. Instead, I'm taking a cue from one of those fantastic Cuban/Chinese restaurants on upper Broadway in NYC. Back in the early 90's, I had mofongo for lunch at one of those places, and they served it with a most excellent spicy tomato sauce. Here are my recommended ingredients for the sauce. Here's another recommended ingredient (for the sauce). You may also want to add bacon (I did). Hey, you're right -- this does look a lot like a Bloody Mary. But think about the bacon. Let's call it a Bloody Maria, OK? Combine all ingredients for the sauce in a small pan, bring to a boil, then simmer for ten minutes. OK, you just heard the microwave ring. Your bacon is ready. Take a large cleaver and chop it up nice and fine. Time for assembly! Arrange the following, in order: your mortar and pestle, your fried plantains, your fatback (bacon), your garlic, and a nice large bottle of olive oil. Start mixing and smashing all these ingredients in the mortar. Pour a little olive oil, every now and then. After you pummel and pound about 500 times -- OK, have another beer -- clump up the mass into little balls, and place on a cookie sheet lined with foil. Now go fetch your spouse. It's time to heat up the mofongo, and this is the perfect moment for social drinking. Place the cookie sheet in the oven, set the temperature to 350 F, and wait for your mofongo while you and your loved one listen to Xavier Cugat, Tito Puente, or Celia Cruz (maybe Mambo Kings, if that's all you have). Get romantic. Try not to look embarrassed. Thirty minutes. Serve the mofongo in the nicest wooden mortar (proper name = pilón) you can find. This one belonged to my abuelita. It's about forty years old, and has a scent of plantain, garlic, and oil that's intoxicating. 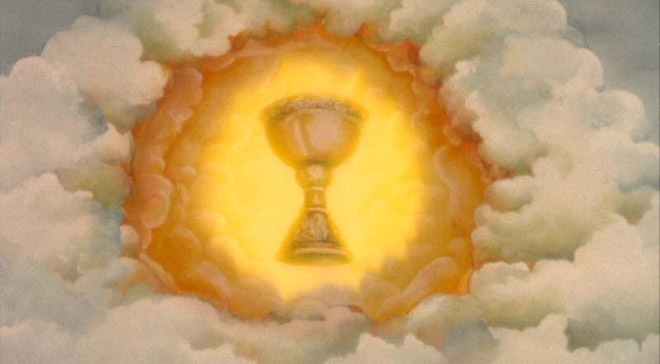 You may not need such an ancient, metaphor-laden, grail-like vessel to create the desired effect. But it you like the meal, take the pilón and pass it down to your Puerto Rican progeny. Your pilón may not be ancient now, but it will be someday.